Hello, friends! Contrary to popular opinion, I have not, in fact, died. It has just been an incredibly busy semester. 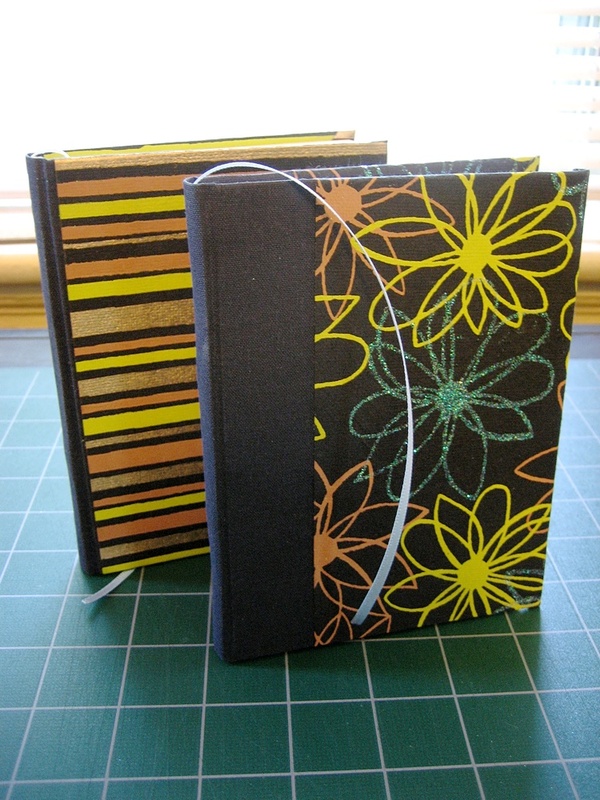 I knew it would be unlikely that I’d have time to do much binding, but I did expect to at least be able to keep up with the blog. Unfortunately, between two jobs, a compressed summer class, and that whole planning-a-wedding thing, time has been short. Rest assured that I’ll be back in full force after it’s all over—and, thanks to the wedding, I’ll have some new books to show off. 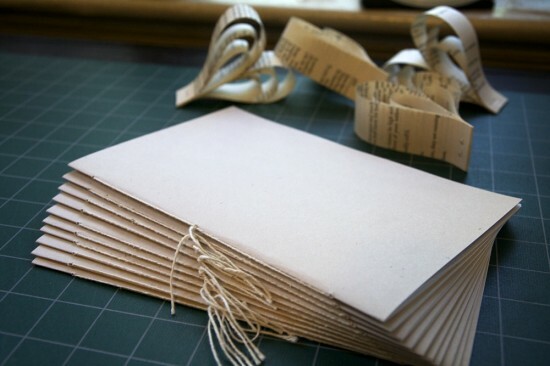 As a preview, I’ll simply say that our wedding will feature a number of handmade items, including the guestbook (Coptic), a book for our vows (dos-à-dos—isn’t the symbolism lovely? ), ceremony scripts (pamphlet), an accordion book to mark our seats, other signage, programs, a gift for my future husband, and a small army of paper hearts. I’ve already completed the programs, scripts, and paper hearts and started some of the other items, but there’s a still lot to take care of between now and our big day. Paper hearts made from the pages of Whitman’s Leaves of Grass. (Leaves have a special significance for my fiancé and me, and poetry is never far from my heart.) I wonder whether Walt would be dismayed or pleased by this treatment of his brilliant text. Ten copies of the ceremony script, in Speckletone cardstock from the French Paper Company. That’s more than we’ll need, but pamphlet bindings are easy enough that I made extra, just in case. I like the look of the dangling threads here. The groom’s gift is my favorite item I’m making on right now. Working on this gave me some additional practice with a pseudo-Coptic binding style of sewing the signatures together (technique from Artemis BonaDea), since I didn’t want to sew it on tapes (read: I ran out), and I think I’ve finally figured out why things have been looking weird at the first and last sewing stations. This will be crucial for when I finally bind up the signatures for the guestbook. Luckily, the sewing won’t be visible in my fiancé’s gift once it’s completed. I’m actually contemplating finishing this one in the bradel [PDF] style. The main reason for this—aside from the fact that I’m fascinated by anything German and I’d like to start learning more about historical bindings—is that I’m contemplating half-participating in Bind-O-Rama this year (i.e., binding a copy of The Bonefolder, but probably not submitting). As I noted earlier, I don’t have much free time right now, so it’s a good excuse to try things out. I won’t post shots of the covered book until after the wedding, to maintain some element of surprise. 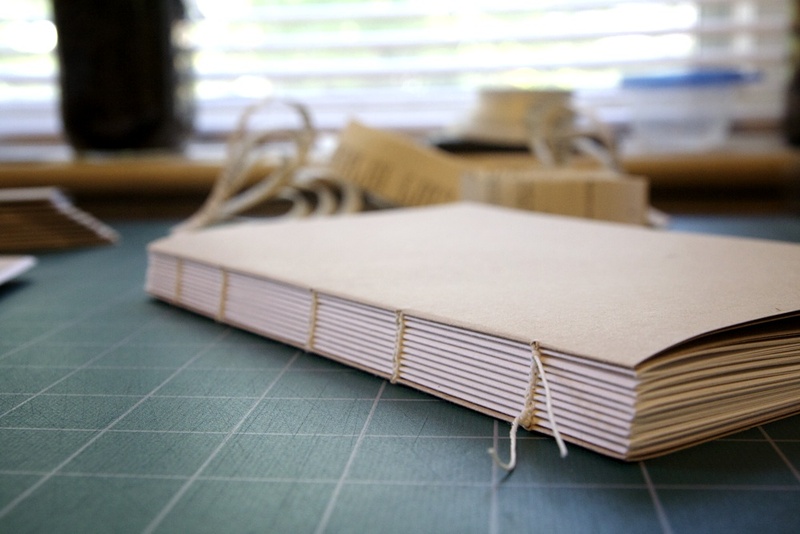 This is my first time sewing a cased-in book without tapes. I also used fewer leaves per signature than usual (folio in sixes, instead of in eights or tens), but the resulting swell at the spine means I’m going to have to back it. It’s going to be tricky, without a backing press, but I have a plan for faking it. Thanks to a tip I learned from Lisa Clark at Baker Library, I also sewed in the folio-in-fours endsheets, instead of tipping on a single folio. It’s a nice touch. I’ve also realized that I made two books late this spring that I neglected to post about. The one with the flowers was a mother’s day gift (pro tip: avoid paper with sparkles—it’s a nightmare to work with), and the other was for my fiancé, who I promised a book (his second) to quite a while ago. I tried something different with the cover for my fiancé’s gift. Not sure I’m thrilled with the look, but it’s always fun to play around with the details to see what works and what doesn’t. In any case, between now and the beginning of August, it’s work, work, work. You might not hear from me for a while, but I’ll be poking around on Twitter when I can. (Follow me at @BindObs, or glance at the recent tweets on the sidebar.) I’ll try to prepare a bit of a post backlog in August, so that while I’m off getting married and exploring Scotland in September you’ll have some book-arts things to read about. If you’re especially lucky and I can find some of those book sculptures while we’re in Edinburgh, I’ll even have some nice pictures to show off when I return. 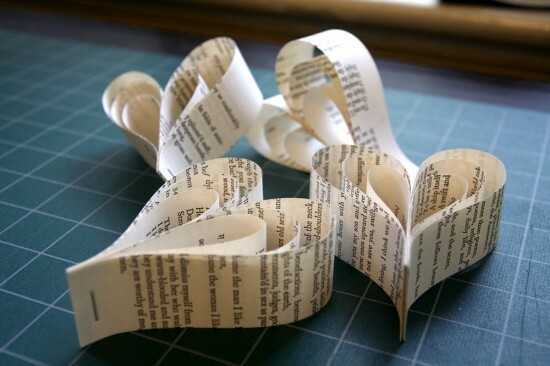 (If you have any other must-see book arts-related things to recommend for Edinburgh and/or Glasgow, please do let me know.) Happy trails!